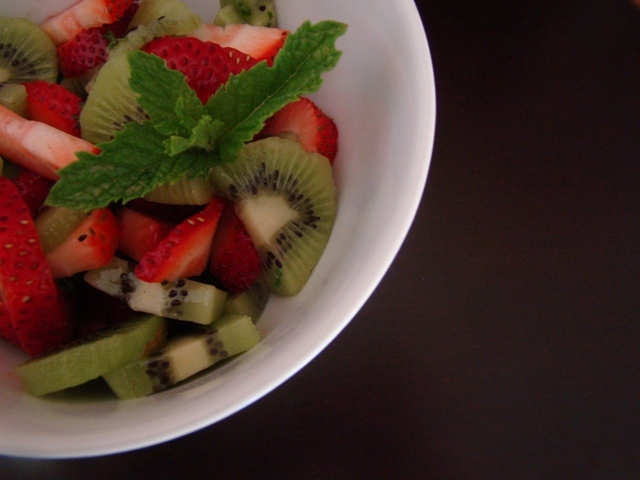 One of Rice Kernel’s favorite things is my mother-in-law’s strawberry kiwi sorbet, which is the inspiration for this simple fruit salad. Place all of the fruit into a large bowl. In a small bowl, whisk the honey, lime juice, zest, and mint. Right before serving, pour the dressing over the fruit and toss gently to combine. Okay, it’s technically not summer anymore. But you wouldn’t know it by looking out the window or looking at the garden. 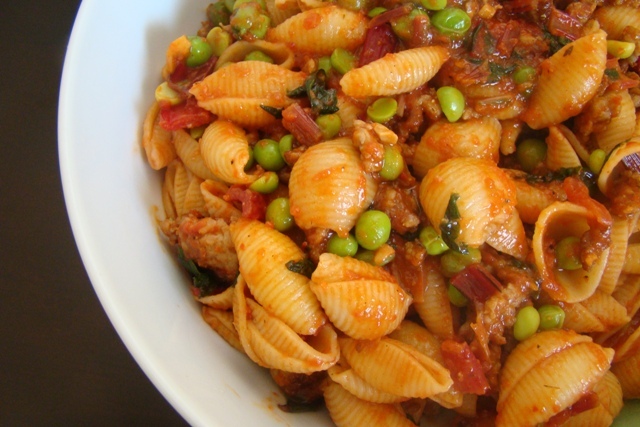 This pasta has an unexpected tang from the roasted red bell peppers. Although your eyes will see red and think “tomato,” your taste buds will experience the depth of flavor and sweetness that only red bell peppers have. Feel free to mix in vegetables of your choosing and any other proteins you enjoy. Bring a large pot of salted water to a boil and prepare a small ice water bath. Cook the peas for about 10 minutes (once again, this will be al dente, you can cook them longer if you prefer them softer), scoop them out with a large slotted spoon and plunge them into the ice water bath as well. Drain. Add the pasta into the boiling water and cook it according to package instructions. Drain and let cool, then toss in a large bowl with peas and Roasted Red Pepper Vinaigrette, seasoning to taste. Add cooked sausage, nuts, or cheese, if desired. Place roasted red bell peppers in food processor bowl. Season them up with salt and pepper. Add garlic and vinegar to food processor. Turn processor on and stream in extra-virgin olive oil and some honey. When dressing is smooth and combined, stop and adjust seasonings. We really enjoyed this recipe. Perfect for a light supper or a special brunch, the salad can be prepared just before serving or the components can be prepared up to 1 day ahead and refrigerated. While the vinaigrette is wonderfully savory and herbaceous, in a pinch you can use any store-bought dressing, tapenade or pesto. Cook salmon in a pan or on the grill. Transfer the salmon to a plate and let cool to room temperature. Meanwhile, put the potatoes in a large saucepan and add water to cover. Bring to a boil over high heat, reduce the heat to medium-low, cover and simmer until the potatoes are tender when pierced with a knife, about 15 minutes. Drain and, when cool enough to handle, peel and cut into slices 1/2 inch thick. Set aside on a large plate to cool completely. Cut beans into 1-inch lengths. Place in boiling water and cook until tender-crisp, about 3 minutes. Drain and rinse with cold water. Pat dry and arrange next to the potatoes on the plate. When the salmon is cool, cut it into 1-inch chunks. To make the vinaigrette, put the sun-dried tomatoes in a heatproof bowl, add boiling water to cover and let stand for 5 minutes. Drain and cut into 1/4-inch dice. In a small bowl, whisk together the olive oil, lemon juice, sun-dried tomatoes, parsley, dill, orange zest, garlic, 2 Tbs. water, salt and a grind of pepper until blended. 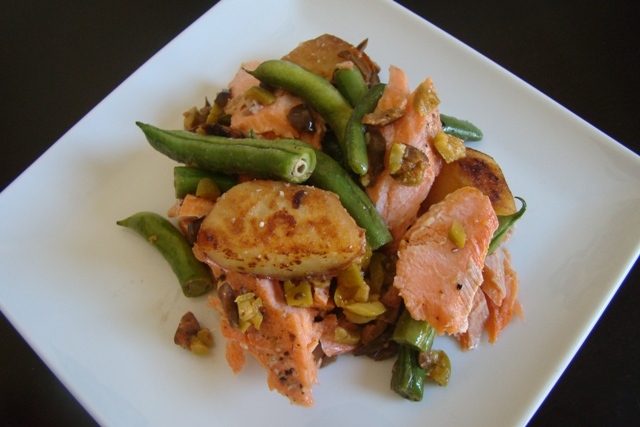 Sppon vinaigrette over the green beans, potatoes and salmon. Using a large, flat spoon or spatula, gently coat the ingredients evenly with the dressing. Serve at room temperature. Add additional mixed greens or spinach, if desired. We made a last-minute decision to spend the weekend in Lake Tahoe. With some leftover vegetables and grilled chicken to get through, I picked cilantro from the garden to tossed together a quick (warm or cold) pasta salad. Cilantro is an ideal springtime superfood. Its remarkable components have shown the potential to help promote detoxification, reduce high blood sugar, and lower levels of cholesterol. Health benefits aside, this light and tangy vinaigrette is delicious paired with a salad and versatile enough to use as a marinade or a sauce for pasta, poultry, steak, shrimp, firm fish (like tuna), eggs, or roasted/steamed vegetables. (Really, anything.) 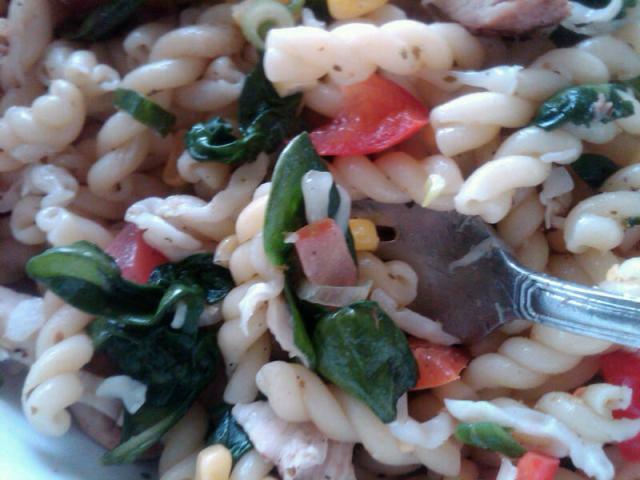 For a quick dinner, we placed raw spinach, tomatoes, chopped carrots, bell peppers, corn, and grilled chicken in a bowl, topped it with hot gemelli, and tossed everything with the vinaigrette. The heat from the pasta will wilt the vegetables and soak up the dressing. I know there are legions of cilantro haters. I’ve heard it called the “most loathsome garnish of our time.” Dramatic, I think, because I adore the herb. Even if you don’t enjoy cilantro as much as I do, I hope you’ll give this a try. You will be surprised how refreshing this flavorful, slightly sweet dressing tastes. It’s springtime in a bowl! Leftover dressing will keep refrigerated for up to a week.